It's nice to see that the economy isn't going to the dogs, but rather, going after them. 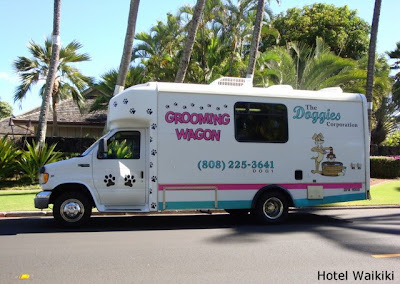 Ann- I wouldn't be surprised if the grooming wagon is originally from the northeast. That "Cupcake Truck" with tubs of different frostings.... that'll cheer up the neighborhood. Funnyface- pooch mobiles are everywhere, then? That's the Internet for you. Rowena- There's not much wrong with purveying personalized services. And a down economy might just provide a kindly reminder. Hey RONW - I know of folks who co-op with their neighbors and get all of their dogs groomed on the same day, and get "volume" discounts from the mobile dog groomers. This helps, especially when a good amount of elderly live in your neighborhood, since they don't get around much. Grooming ain't cheap anyway....our mutts cost $44 each to get groomed.... man, I thought haircuts were expensive! Ok. Now back to our regularly scheduled conversation about dog grooming....do you think those wagons take cats? Ann- Yale lets them park on campus, according to the map on their website? And no, cats and dogs together wouldn't work out inside the same grooming truck, so I suppose, it's strictly for pooches.